Over-fusing is the simplest and most terrible single thing that could kill your family and burn the house. If you replace a 15 Amp fuse or breaker protecting a 15 Amp circuit with a 20 Amp or 30 Amp fuse or breaker, the next thing you should do is book your own funeral. Over-fusing happens when the rating of the fuse or breaker is too large for the rated ampere capacity (or ampacity) of the circuit it is supposed to protect. Too much current (or too many Amps) would flow through the wire and burn it before the fuse or breaker blows or trips. Burning insulation will ignite an extremely dry dust inside your walls and ceiling. Over-fused circuits are often the longest and, at the same time, the most overloaded ones, going to different rooms and floors in the old house. And the fire could instantly start all over the place, spreading on to the wooden frame, cutting off exits and escape routes. One needs just 15 seconds to change the fuse and cause the dumbest tragedy. In fact, a 20 or 30 Amp fuse or breaker on a 15 Amp circuit becomes an armed fuse of a ticking fire bomb! 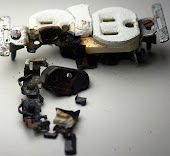 DIY homeowners, unqualified handymen and renovators, deteriorated wiring and over-fusing or fuse tampering, misuse and abuse of electrical system together create a single most prevalent cause of home fires. It is a hot summer afternoon and you plug in a window air conditioner. Or it's a cold winter night. You decide to use a portable space heater. The 15 Amp fuse blows. You replace it with another 15 Amp one. It blows again and again. Now you replace it with a 20 Amp fuse. Stop it right there! You have just created a new and deadly problem instead of the annoying one. A properly protected light and/or wall plug circuit in your home should have a 15 amp protection feeding 14 gauge copper wires. So that all or most of single pole 110 V branch devices in the panel should be 15 amp rated with the exception of 20 amp kitchen plugs, if any. Also excepted are two pole 220V or 240 V electric range 40 amp; electric dryer 30 amp; central A/C and electric water heater, each 20 amp or 30 amp; and baseboard heater 20 amp or 30 amp circuits, if any. Here is a tip to ensure you are not over-fusing your electrical system: check your main box and pony panel (if any) for extra 20 Amp and 30 amp fuses and breakers. These often indicate an overfused circuit. Remove or unscrew (at your own risk) all 20, 30 and 40 amp fuses, turn off all such breakers. This should include pull out cartridge fuses, remove them too. Then check each and every light and wall plug in the house including furnace, fridge, microwave, and outdoor items. If one or some of them do not work, then there could be a problem and you need to call an electrician. Always have the proper size spare fuses available. 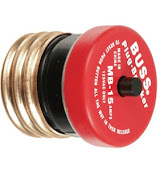 Buy a screw-in mini-breaker type fuses (see at the bottom right) that can be reset to resume normal operation and replace the ancient single use ones. If you are not sure, if a circuit repeatedly blows fuses, or bulbs turn off and on or flickering, then call a flickering light electrician in Mississauga to check your electrical system.